Captain's unbeaten 208 lifts India to 392 for 4 to set up 141-run win in second ODI, despite Mathews's hundred. Rohit Sharma rewrote history by scoring his third double-century in One-Day International cricket, a brilliant 208 not out off 153 balls, as India won the second match in Mohali by 141 runs on Wednesday to level the three-match series 1-1. Shot out for 112 in the first ODI on Sunday, India paid Sri Lanka back with interest at the PCA Stadium in Mohali by amassing 392 for 4 in 50 overs. It was India’s 100th score of 300 or more in ODIs, with the captain leading from the front with another blistering effort. Rohit took his time to get his eye in and after he passed 100, he unleashed an all-out attack. Batting on 101 at the end of the 40th over, he more than doubled his score in the last ten, hitting 13 fours and 12 sixes in all in his record innings. He was aided by half-centuries from Shikhar Dhawan (68 off 67) and Shreyas Iyer (88 off 70) as the home side set Sri Lanka a mammoth target. It was never going to be an easy chase for the visiting side. Although Angelo Mathews scored an unbeaten 111 off 132 balls, Sri Lanka was always lagging behind the asking rate. It finished on 251 for 8 in 50 overs. In the morning, Thisara Perera, after winning the toss, asked India to bat again under overcast conditions on a pitch which looked quite akin to the one in Dharamsala. But the similarities ended there as Shikhar Dhawan took the attack to the Sri Lankan bowlers straightaway, showing that Dharamsala was just an aberration as normal service was restored. There was a visible difference in the approach of Dhawan, who was stuck in the crease in the first match. He countered the initial movement by stepping towards the ball and hitting through the line on a regular basis. When the bowlers shortened their length, he cut and pulled with disdain. Rohit looked tentative early on but grew in confidence as his innings progressed. Dhawan struck three fours in one Nuwan Pradeep over and brought up his 23rd ODI fifty off 47 balls. Suchith Pathirana finally broke the 115-run stand when he beat Dhawan in flight as the batsman looked to go over the top. Lahiru Thirimanne aided him well with a sharp catch short mid-wicket. Angelo Mathews smacked 111 in 132 deliveries, his second ODI century, but found little support from the other end. Rohit, however, continued to remain subdued, reached his 50 off 65 balls with a gentle push through extra cover. Shreyas Iyer, not too impressive in his brief international career, started in a confident manner, picking up singles with ease and hitting boundaries when the opportunity came. India’s 200 came up in the 35th over as the Sri Lankan bowlers looked helpless on a track that offered little assistance. From slower ones to bouncers, they tried everything, but both Rohit and Iyer handled all that with ease. Iyer got to his maiden international fifty off 50 balls before shifting gears, smashing Perera for a six over point and then dragged him past the mid-wicket fence. Meanwhile, Rohit got to his 16th ODI century off 115 deliveries, going past Virender Sehwag in the list of most ODI tons for India. He too opened up after reaching the milestone, putting the bowlers under pressure. He hit four sixes in Suranga Lakmal’s one over, the 44th of the innings, as India moved from 250 to 300 in just 20 balls. Rohit brought up his 150 off just 133 balls with back-to-back sixes off Pradeep. 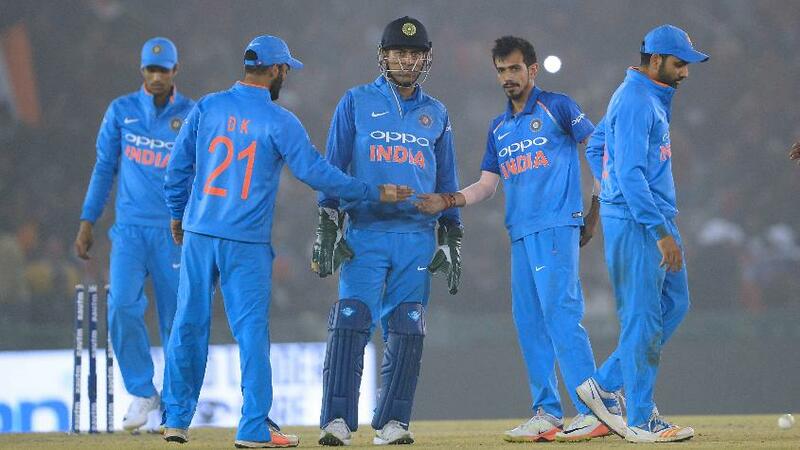 Yuzvendra Chahal was the pick of the bowlers finishing with figures of 3 for 60 in his ten overs as India romped home by 141 runs. Iyer too mixed deft touches with powerful hits but was dismissed in the pursuit of quick runs. He hit nine fours and two sixes, adding 213 off 146 balls for the second wicket with Rohit. Rohit kept going for his shots, toying with the bowling and hitting sixes all over the park. He brought up his 200 off 151 balls in the last over of the innings, with the second hundred coming up in just 36 balls. Pradeep was taken for 106 – the joint-third most in an ODI – off his ten overs while Lakmal, the star of the first match, ended wicketless, conceding 71 off his eight. Sri Lanka needed a brisk start in order to have any chance of overhauling India’s score. But that didn’t happen as Hardik Pandya dismissed Upul Tharanga for just seven. Washington Sundar, the debutant offspinner, bowled Lahiru Thirimanne for 21 for his maiden wicket as the side was reduced to 62 for 3. Mathews tried to hold the innings together, but wickets kept falling at the other end. The former captain went past 5000 ODI runs during his hundred, but the target was simply out of reach by then. Yuzvendra Chahal was the most successful bowler for India, picking up 3 for 60, while Jasprit Bumrah chipped in with 2 for 43.